Summer is one of the best times to enjoy the country’s parks. Travelers can take advantage of the warm weather to enjoy the park sites, hiking trails and other features. Lackawanna State Park, in northeastern Pennsylvania, is one that’s just waiting for you and your RV to arrive this summer. Lackawanna State Park is an outdoor playground — just 10 miles north of Scranton — that’s ideal for campers of all ages. The 198-acre Lackawanna Lake is one of the park’s greatest features. Travelers are encouraged to bring their boats, fishing poles and swimsuits. 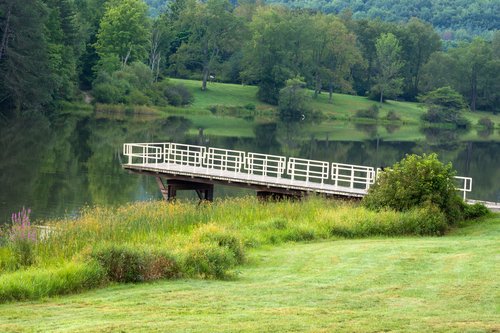 Other Lackawanna State Park activities include hiking, mountain biking, camping, geocaching, hunting, horseback riding, picnicking and simply enjoying the park’s many recreation areas. The park includes 18 miles of hiking trails and 15 miles of mountain biking trails. Campers are more than welcome at Lackawanna State Park. The campground is within short walking distance of the swimming pool and lake, and the facilities include warm showers, flush toilets and electric hookups. Two loops, Fox Run and Maple Lane, allow campers to have pets in designated areas. The campground is open from mid April until the end of October, so be sure to call ahead and make a reservation before the camping season is over. The base price for a traditional campsite is $15 per night. All Pennsylvania state parks are open year-round, including Lackawanna State Park. Day-use areas of the park are open until dusk, and reservations are recommended for campers, whether you plan on staying in one of the camping cottages, a yurt (a round canvas tent with a wooden deck) or in your own tent or camper. Summer is the best time of year to get an incredible deal on a new or used RV from Fretz RV in Souderton, Pa. Log online or stop in and see us to browse our complete selection.